Figuring out how to switch banks can feel like daunting, but it starts with finding a new bank that that better suits you and makes your life easier. Think of it this way: instead of closing a bank account, it’s really about opening a new bank account and moving forward with a better partner. Switch to a better bank account. No hidden fees. Get paid up to 2 days early. There are a lot of bank account options available, so it’s important to do your research to find a new financial partner that is aligned with your best interests and will help you take control of your finances. Chime is one example of a mobile bank account option that provides an alternative to traditional banks. 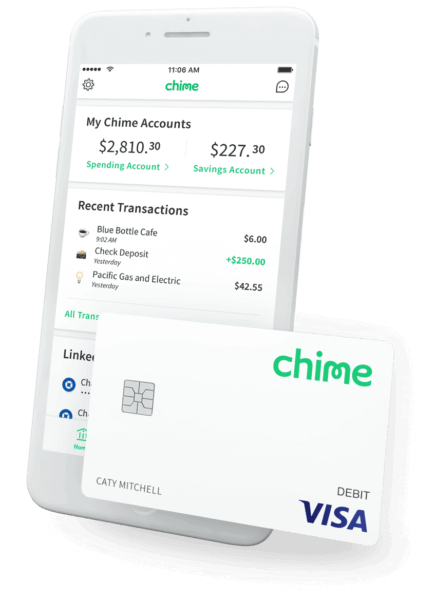 Chime doesn’t charge unnecessary bank fees, helps you get paid up to two days early and provides tools to help you save money automatically all from an award-winning mobile banking app. The first step to switching banks accounts is to open a new one. Chime is a bank account with no unnecessary fees that many traditional banks account charge. That includes no overdraft fees, no monthly fees, no maintenance fees, foreign transaction fees and required minimum balances. Chime’s Automatic Savings program also makes it easy to save money automatically every time you get you get paid and use your Chime card. Get started by signing up for a Chime Spending Account. Opening a Spending Account only takes a few minutes and can be done from your phone or desktop. Once your account is opened, we’ll get started personalizing your Chime Visa® Debit Card. Once you have signed up for an account, download the Chime app in the App Store or on Google Play. 2) Link your old bank account(s). While logged in to your Chime Account, go to Transfer under Move Money and tap Link Bank Account. You’ll be prompted to sign in to your old bank account within the Chime app. This is a one-time step that allows us to connect with your old bank and process every future transfer from your previous account. Once your accounts are linked, you can send a request to transfer money from your old bank account to your new Chime Spending Account. 3) Set up direct deposit. Once your Chime card is on its way, we recommend setting up direct deposit with your employer. It’s easy to switch your direct deposit from your old bank account to your new bank account. Simply provide your bank routing number and Chime Account numbers to your employer and we’ll take care of the rest. You can find this information by tapping Direct Deposit from the Move Money screen. Once you’re enrolled in Direct Deposit you are eligible to get paid up to two days early via the mobile app. If you pay utilities, rent, or student loans, chances are you’ve set up your account to receive money and pay bills automatically. Update your billing information by providing your billers with your Chime card information or new bank routing number and Chime Account numbers. A good way to make sure you’re covered for all of your automatic payments is to look at your last month’s statement and find the monthly recurring transactions you set up: power, garbage, transit passes, subscriptions, etc. Make sure to update your third-party banking apps like Venmo and PayPal, too. 5) Close your old checking or savings accounts. After you’ve received your card, made your first direct deposit and moved all of your remaining bills to Chime, it’s time to complete the switch and close your old bank account. Chase: You can close your account by calling 1-800-935-9935 or online by signing in to Chase.com and sending an email to the customer service department via the Secure Message Center. I am writing to inform you that I am closing my account(s) at your bank. Please close the bank account(s) listed below. Upon closure, please send any remaining funds in those accounts by check to the address provided below along with confirmation of the account closure. Please reject any further requests for transactions on any of the accounts listed. If you’ve made it this far, you should be good to go! Now you’re ready to experience a better bank account that’s actually designed to help you lead a healthier financial life. Switching to Chime is really that easy.